Caputo unveiled an outdoor instruction space in the back courtyard of Kingston on Tuesday. Cherry Hill Girl Scout Alexa Caputo stands in front of one of the four tables she created as part of her Girl Scout Gold Award project. Caputo turned four pieces of construction spool into four tables for use as part of an outdoor instructional area at Kingston Elementary School. Alexa Caputo is an excellent student at Cherry Hill High School West, having been named to the honor roll every semester for her first three years and owning a 3.8 grade point average when she began her senior year this week. Caputo said her first school when she moved to Cherry Hill, Kingston Elementary, is a big reason she has become the student she is today. When she was younger, Caputo said she struggled to learn in a typical classroom environment and had trouble sitting still in class. Despite this, she said her teachers at Kingston were very encouraging and would sometimes take the class outside to help teach them in a different setting. Caputo wanted to create a permanent outdoor learning area to give back to her alma mater. 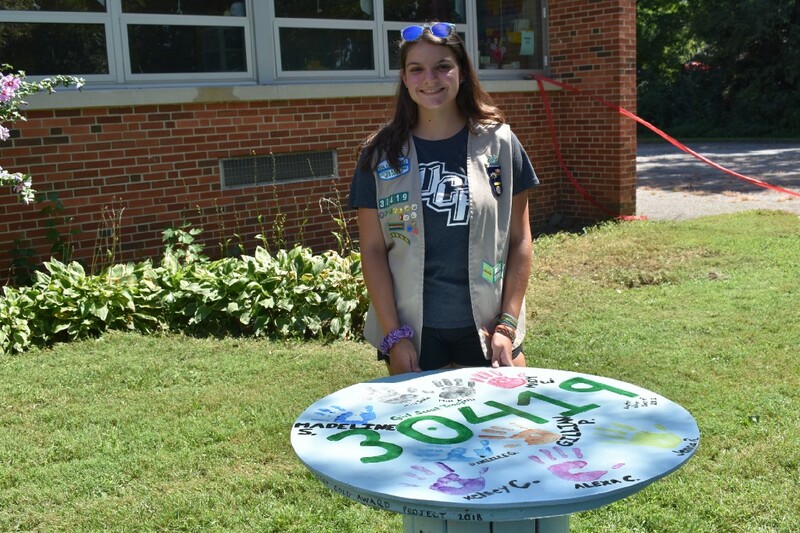 On Tuesday, Caputo unveiled her Girl Scout Gold Award project, four tables made of large construction spools. 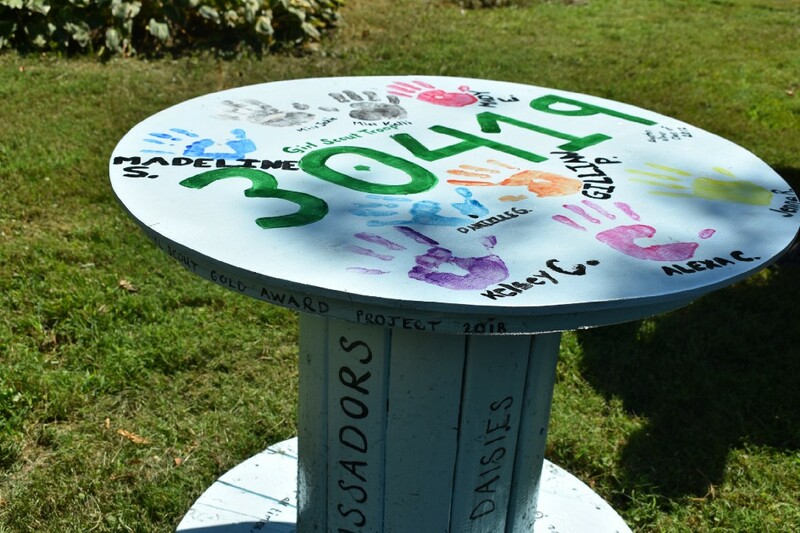 The tables were handpainted and placed in the back courtyard of Kingston Elementary, giving the school an outdoor classroom. Caputo believes the area will help enhance the classroom experience at Kingston, giving students in grades kindergarten through five a chance to learn in a new environment. Caputo is entering her 14th year as a Girl Scout. A member of Troop №30419, Caputo said Girl Scouts is the perfect way to give back to the community and her love of service is why she has continued with Scouting through high school. For her Gold Award project, Caputo used large construction spools she received from a University of Pennsylvania construction site for the four tables. Numerous volunteers contributed to the project, including some of Caputo’s former Kingston teachers, members of her Girl Scout troop as well as Girl Scout Troop №30328 and a number of Kingston’s fifth-grade peer leaders. 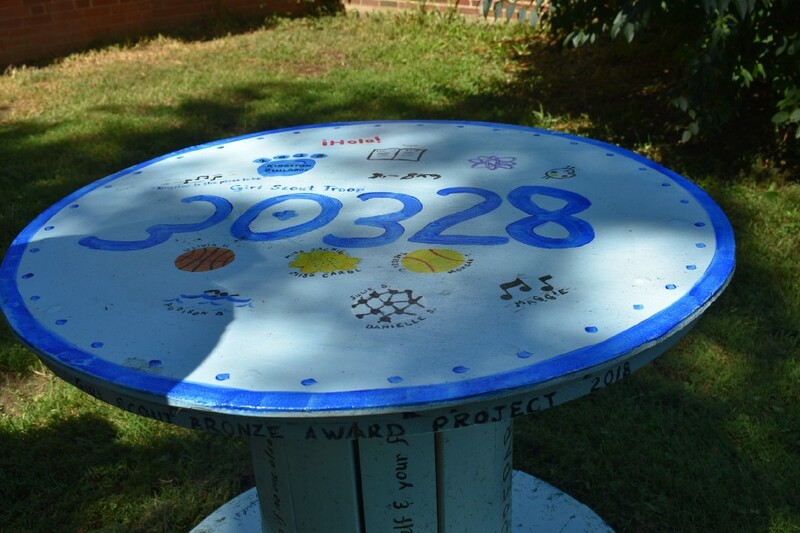 Each of the tables features a unique design and the Scouts and peer leaders who helped paint their tables left their own mark. Numerous school officials joined Tuesday’s unveiling, including Superintendent Joe Meloche and Kingston principal Will Marble. Also attending were Caputo’s former teachers at Kingston, who took a break preparing for the first day of school to check out the new outdoor instruction space. The Gold Award project took Caputo about 90 hours to complete and challenged her artistic and construction skills. Despite this, Caputo said performing service projects such as the outdoor classroom area is what she loves most about Girls Scouts. She encourages other girls in the area to get involved with Scouting and plans to remain involved with the organization as an adult.